It's been a long time since my last update. I've spent the summer planning a garage addition and late summer/early fall building it. This ended up meaning new siding for the whole house and fixing issues that were found once the old stuff was removed. Of course. And other than the concrete work, I did everything myself. The outside is finally done but I still have to finish electric, insulation and drywall on the inside before I can get all of my machines back into place. The mining truck is still going to happen and this addition was the first step. The second step is to build a plasma table. Something else I've wanted to do for a long time. So I've also been collecting parts for that as well. It will be the first project in the new garage. 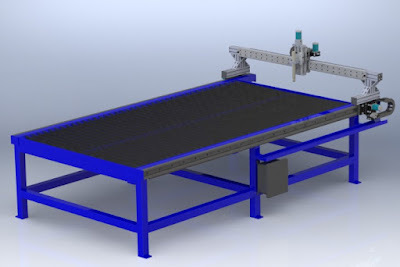 I ended up going with a Precision Plasma gantry that uses linear rail instead of the typical cold rolled steel. I'd like to run a router on it as well (for wood only) so I wanted something a little more precise. The rail is very heavy duty and looks to be very nice quality. I'm anxious to get back to some projects and having my sons help me out with them. I still have a lot of design work to do on the mining truck. And I still need to determine some of the parts I'm going to use before I can do more. I'm really trying hard to fit a 3 cylinder diesel in it. First, they are very tall and the additional need of water cooling will eat up more space I already don't have. So we'll see what I can come up with. I don't think it would be right if it wasn't a diesel.